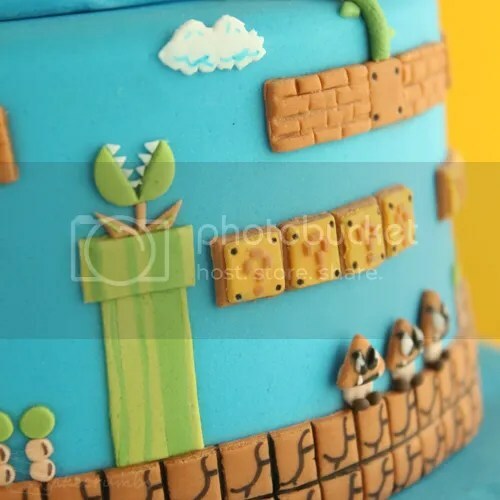 Some of you might remember the Zelda cakes I made for Game Art HQs Link's Blacklist Tribute. Well, a little while ago another artist tribute caught my attention. It's called "Virtual Worlds We Loved" and, as the name suggests, is completely focussed on the worlds, levels or places depicted in games. I love tributes that move away from the protagonists and otherwise famous characters and allow scope for the under-appreciated, unseen, or unusual. The tribute features 30 different artists and allowed for no repeats of games. I almost claimed about Zelda game, but instead decided to depict the first game I ever played: Super Mario Brothers. Ah, the good old days of playing the NES as a kid. We owned 3 games and I repeatedly played each of them. 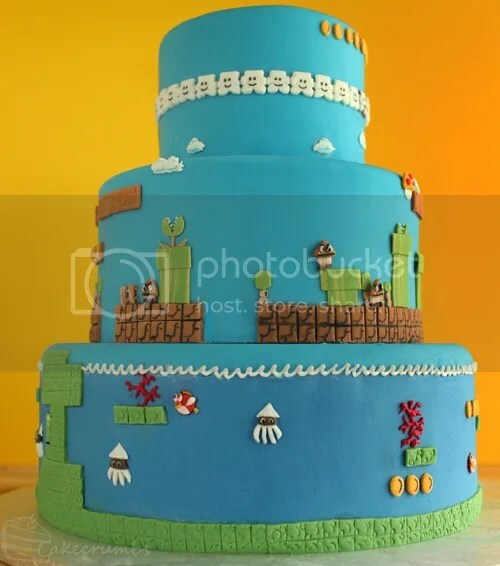 I fell in love with the 8-bit world so I couldn't resist the chance to bring it to life with cake. I opted to depict level 2, for that's the first time we get to see enough variety of worlds to justify three tiers. I wanted to make all the tiers join in a way that befit their sequence in the game. 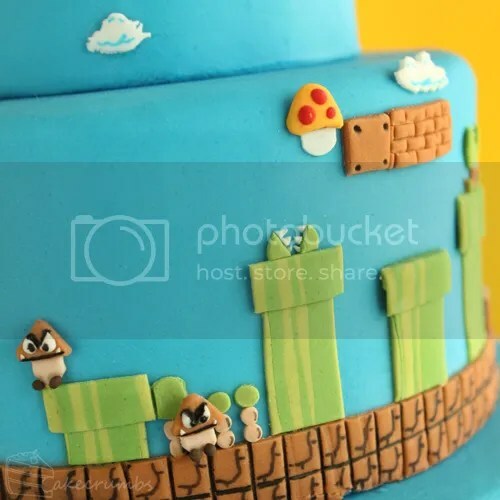 I wanted to make this cake as level-accurate as I could. On the top we begin with the bonus world in 2.1. The not-so-secret little vine that takes you above the clouds and rewards you with a heap of coins and no baddies to spoil your day. Below this is level 2.1. It was in starting this that I realised this was going to be no quick cake. There's more detail in the levels than I gave it credit for. From the stripes on the pipes to the cracks in the ground. I cut the bricks out individually, then painted the cracks onto them. At first I tried indenting them, but they weren't defined enough. The clouds also got a little paint. The really fun, but challenging, part of this cake was the scale. All the enemies were less than a centimetre tall. It's by far the smallest scale I've ever worked on. But I wanted to find a way to squeeze in as much detail as I could. 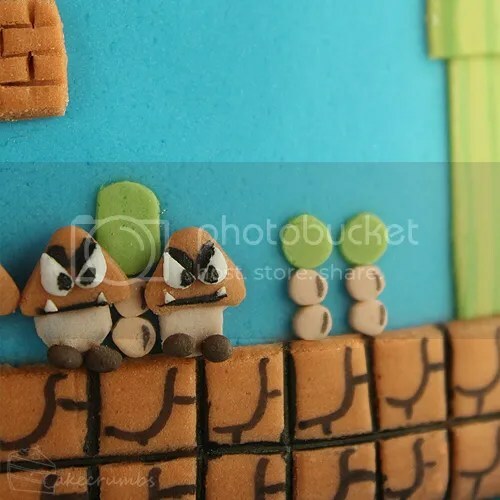 The goombas were particularly challenging, especially with their teeth which (like the piranha plants at times) were less than a millimetre long. I spent an age cutting the tiniest shapes from fondant, and even longer trying to position them in place. One the third tier we move to level 2.2. I considered doing a boss level or any of the underground levels but in the end I decided an underwater level was the most fitting. These bricks were once again hand cut, but instead of painting the features on I indented them this time. It somehow worked on the green, but not so much on the brown. One of my reasons for choosing the early levels was that I wanted to fit the entire level around the cake, so I'd opted for the shorter levels. Once I started scaling it to fit I soon realised there was no way it would all fit, so I had to choose my favourite parts of the level and find a place to make them seamless. 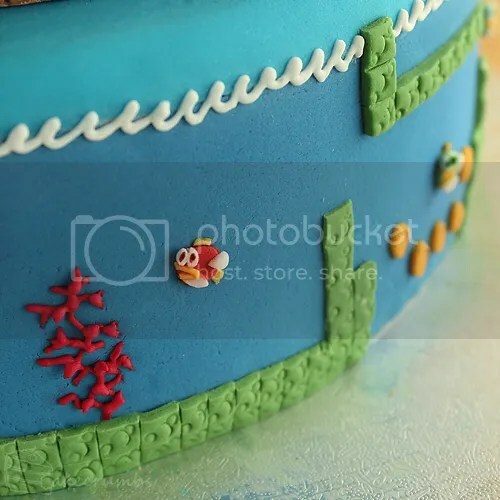 The only parts of the cake that weren't fondant were the corals and the waves, both of which I piped with royal icing. It was a firm reminder of how terrible I am at piping. Ack. And here's for a 360 view of the cake. 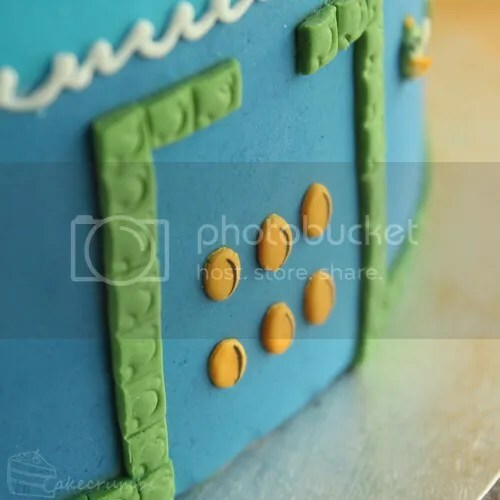 There's no 'front': the levels extend the entire cake. But this side was definitely my favourite. Everything was hand cut and painstakingly embossed or painted to squoosh in as much detail as I could. It took a total of 5 days to complete. Staring at it, it looks so simple. It's hard even for me to imagine why it took that long. It's easy to miss the detail, much the same as when playing the game. But it's the time taken to mimic the detail that, I think, makes the cake. So much of it looked so bland when I first added it. But as I began to emboss or paint, it really started to pop. The best thing I learned from this cake was that there's no such thing as too small. I think back to things in the past where I left out of a cake or cupcake topper because I deemed it much to small to be possible. But after working on scales of millimetres, nothing is impossible any more. Just really, really time-consuming. Wow. I am in awe! So much detail. As usual, I’m very impressed. 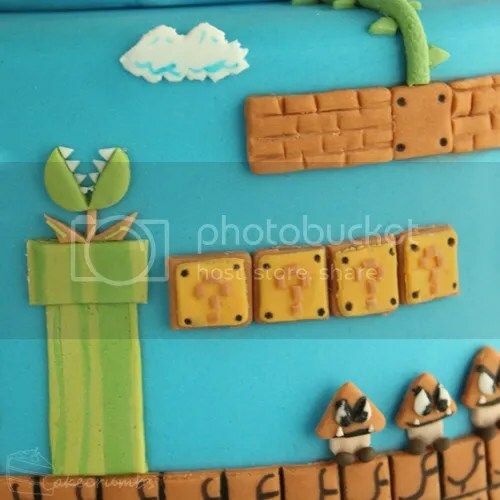 Whenever I play Super Mario Bros now I’ll think of this cake. I still have the song in my head. OMG this cake is amazing!!! Such beautiful detail! 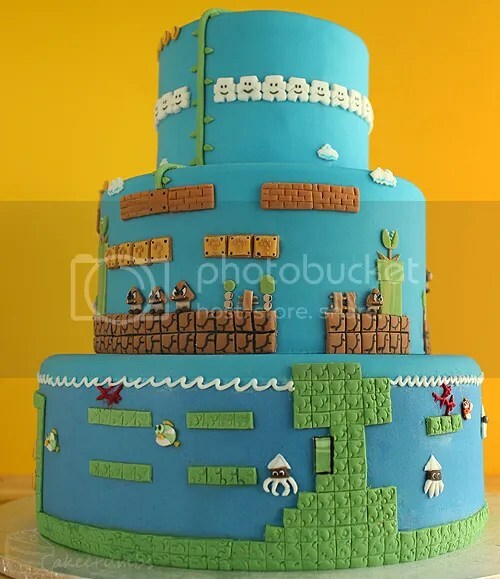 If I ever had a cake like this I dont think i’d be able to eat it! You are very talented! 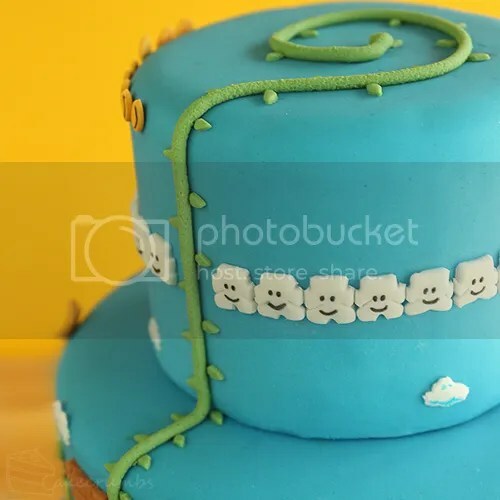 That’s a wonderful cake. 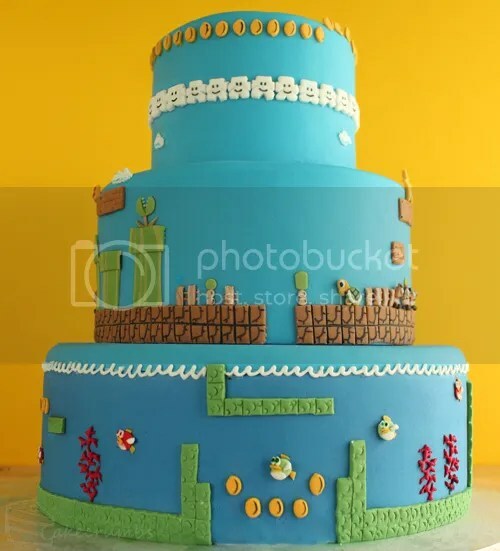 My son would freak out, if this would be his birthday cake. But where are Mario and Luigi? I can’t believe you forgot them! Not to fear, they were absolutely not forgotten. 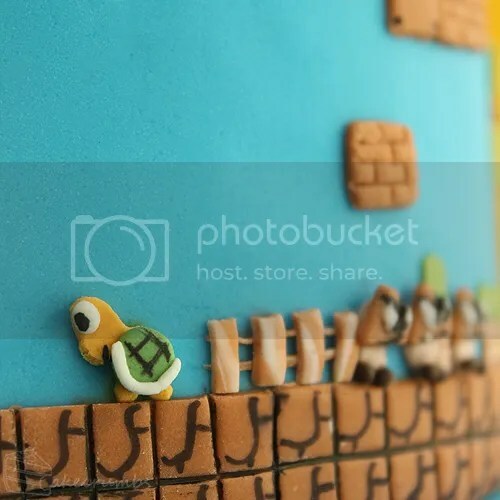 :] That cake was made for a Virtual Worlds game art tribute, so the point was to focus on the world itself and not the protagonists. This is just…. Excellent !!!!! Thank you! I had that darn song stuck in my head the whole time it took to make the cake — so I’m glad I can pass it on to someone haha. I feel your love for red cap brothers mustache adventure. It’s such a hard game not to love! 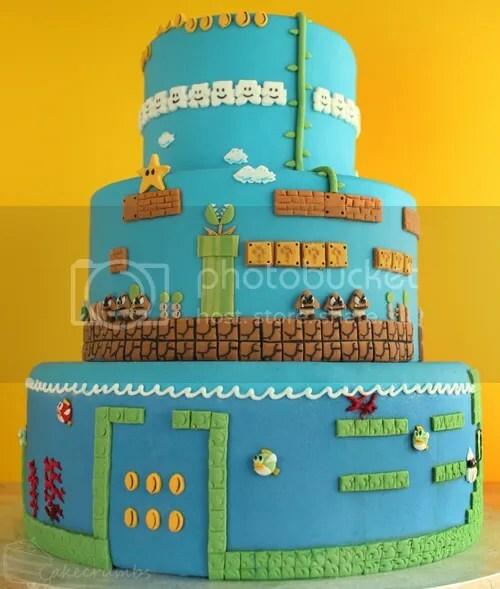 This cake looks amazing and takes me back to my childhood! Great work on the details. It is awesome. Awesome.. but wait. I didnt see mario? Where is he? In another cake! 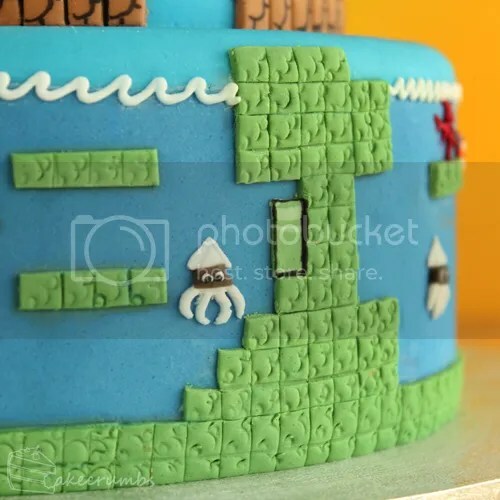 That cake was made for a Virtual Worlds game art tribute, so the point was to focus on the world itself and not the protagonists. you should take part in great Aussie bake off, I am sure you will win hands down….